Lock in a great price for Hotel Diament Plaza Katowice – rated 8.5 by recent guests! Great location! Staff was very nice and helpful, big choice for breakfast! Location location location. Friendly and helpful staff. The staff was very friendly and Magdalena in the reception was absolutely the best. Good location, comfortable rooms very friendly staff. Good hotel in the city centre, excellent breakfest. Excellent location in the centre of the town and railway station, very friendly staff, good wi-fi, good breakfest, quite and clean room, minibar. Hotel Diament Plaza Katowice This rating is a reflection of how the property compares to the industry standard when it comes to price, facilities and services available. It's based on a self-evaluation by the property. Use this rating to help choose your stay! 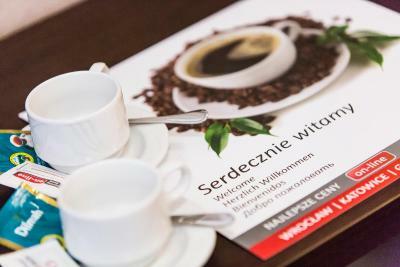 One of our best sellers in Katowice! The 4-star Hotel Diament Plaza Katowice is located in the centre of Katowice, just 1,000 feet from Katowice Główny Railway Station. The hotel offers rooms air-conditioned rooms with free WiFi, satellite TV and tea and coffee-making facilities. Each has a private bathroom with a hairdryer and either bath or shower. A varied buffet breakfast can be enjoyed every morning at the hotel’s elegant restaurant, Diamentowa, where Polish and regional dishes are served. The helpful and friendly staff at Hotel Diament Plaza Katowice is available 24 hours a day and can assist with airport shuttle. Guests can use luggage storage and enjoy free takeaway coffee, as well as order laundry and ironing services. Private, guarded parking is located 150 feet away. Hotel Diament Plaza Katowice is located 800 feet from the Silesian Theatre. The popular Spodek venue is only 0.6 miles away. Katowice Airport, as well as Kraków Balice Airport can be reached within a 45-minute drive. This is our guests' favorite part of Katowice, according to independent reviews. When would you like to stay at Hotel Diament Plaza Katowice? Air-conditioned room with a flat-screen TV with satellite channels and tea/coffee making set. Air-conditioned room with a flat-screen satellite TV and a tea/coffee making set. Extras include a bathrobe, slippers and a restaurant voucher whose value is PLN 35 per person. An air-conditioned suite with a mini-bar and a bathroom. Extras include a sofa and 2 armchairs. An air-conditioned apartment with a mini-bar and a bathroom. Extras include a sofa and 2 armchairs. House Rules Hotel Diament Plaza Katowice takes special requests – add in the next step! All children under 16 years are charged PLN 100 per night for extra beds. Hotel Diament Plaza Katowice accepts these cards and reserves the right to temporarily hold an amount prior to arrival. My room had not been properly cleaned when I first entered it. One other point - this probably isn't the hotel's fault, since I stayed there at Easter, but it was a little depressing to feel one was almost on one's own there. Great location (short walk from the railway station) and excellent breakfast. Room was spacious, and the internet worked well. Good shower - with an extractor fan that worked properly! Right next to the main restaurant and bar area of Katowice. First when we arrived the building next to the hotel was under construction. During the day, even if our room has a inner view, the noise of the machines was really annoying… You have to prevent those kind of thing and help the customers. The same as concerns the elevator not working (we were at the 3rd floor!!!). The guys propose to help us, but, for my personal long experience in this business, I know you have to give more than 100% when those kind of things happen, nevertheless you are giving to the customer less than he is paying for. Moreover the hotel was quite empty, and so, I wonder why they don't give a different position for our accomodation. In the end the cost is too high for the standard of the hotels we met in Poland. The hotel is placed in the center, near shopping mall and best attractions. Room was very comfortable, bathroom so big. Breakfast was excellent. Interior of the hotel impressed us. The cleanliness in the room was excellent. the works outside the hotel. The shower was not functioning properly. Probably the decoration of the hotel will have to be renewed. The products in the breakfast are ok but could be upgrade to more european standard for a 4 stars hotel ! It was a bit cold in the room. But the reception explained how to turn on the radiators in the room, so then very quickly it got warm and cosy inside. Good buffet breakfast. Very good location! I was extremely frustrated with the staff. When I purchased my room on Booking.com I only purchased 1 room. I received a confirmation from Booking.com for only 1 room. When I was checking out from my stay, the front desk charged me for 2 rooms. When I showed them my confirmation number, they told me that my email was wrong and that I have to pay for 2 rooms. I asked to speak to a manager and they told me they would not let me speak with her. The lady told me the manager reviewed it earlier in the week and that she would not allow the room to be removed from the bill. They would not let me leave until the balance was paid. I was so upset with how this was handled by Hotel Diament Plaza Katowice. Because they would not look at my confirmation number I had to pay an extra $1000.00 USD. I now have to call Booking.com to try and get this resolved. 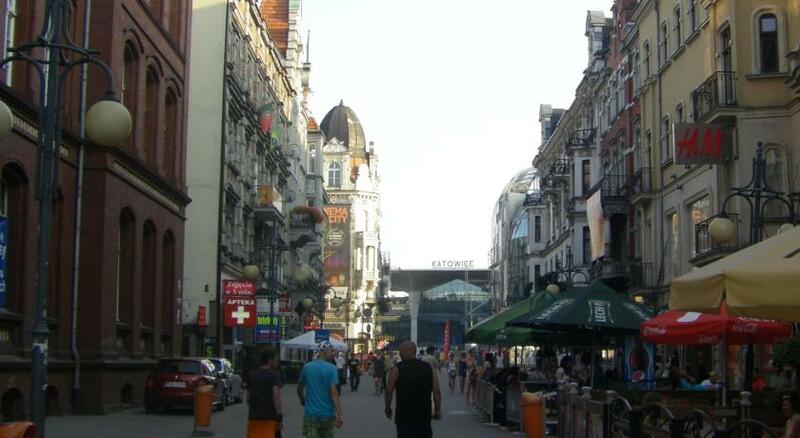 There are so many other places to stay in Katowice. I would highly recommend not staying here. They will charge you things you won’t be aware of until checkout. I’m extremely disappointed with my experience here.